Sruthy was the brightest student in her class. She was the apple of her mother’s eyes. Her being born in a less fortunate family had its streaks of misfortune. She was born with Partial Blindness, a disease passed on from her mother. 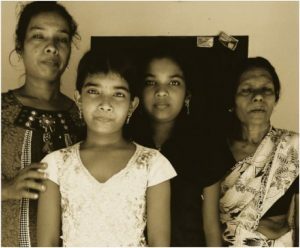 Her father left the family soon after and so it was only her mother who had the responsibility of feeding two daughters. Struthy learnt to fend for herself from an early age. Hardships taught her everything. Until recently she fought her daily battle with half vision of the world but then her medical condition deteriorated. She started getting acute headaches and her vision started giving her problems. She couldn’t study, she couldn’t think properly and she couldn’t live her life like before. Struthy (in dark dress) with her family before surgery. What did we do as kids when we got hurt? We waited till our father got home in the evening. We showed him how we got hurt and told him each detail and waited for his reassurance that everything will be back to normal once again, that the pain will go away. It was always just a scratch, wasn’t it? Now imagine this girl, she can’t see properly, her days are filled with head pain and misery. She wants her father to help her maybe but he comes only once a week and doesn’t even get her a chocolate. He comes to fulfill his duty to see her. Can you even imagine her pain? We can’t, we only have tears. But life has its own ways of making up for things lost without our fault. We tried to get some people together who could give back the colors of her life, give her a new vision to see life in an entirely new light. She only needed a small surgery. Of course we were successful in getting that surgery done because we have people like you in the FFA family. 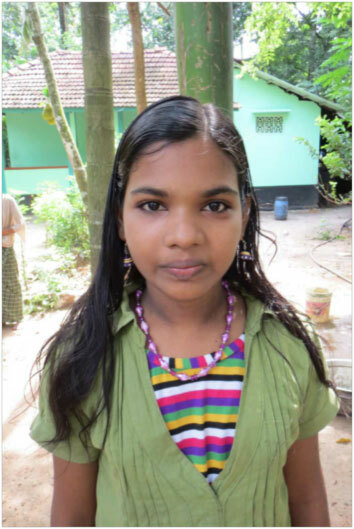 Through a crowdsourcing project, we raised funds for Sruthy. She is now good to go and brace life like never before. She is doing great and we wanted to share her candid letter to the FFA. Enjoy her innocent words written from the sheer joy of being able to see the world again! I am Sruthy writing this letter to express my heartfelt gratitude towards you dear uncle for enabling me to have sight like other people. My family is being helped by you since 2010. My grandmother is suffering from various complicated health issues and has vision problems. Likewise my mother too is having problem with sight. Doctors diagnosed that this is related with nervous system and complete cure is impossible. My mother could not be taken for treatment in time because of our financial difficulty and you entered our life as a God sent angel and our life improved little by little. My grandmother is now able to take regular medicines for her ailments and with proper food and care her health has improved much. My mother’s vision problem is not able to be cured but she can see feebly with one eye. She is going for packing works in a nearby company. My mother had to face much struggles after her marriage due to her blindness and had to return to her mother house. Our father was helpless to support us as he cannot go for regular work due to prolapsed disc problems. Now he comes only occasionally to see us. As I progressed with my class studies, I understood that I am losing my sight gradually. In every class there is a method that students are rotated from front to back bench wise. When our turn came to sit at the back rows, I could not see what was written on the board. Moreover water used to come to my eyes and I had constant headaches. With your kind help my mother took me to a specialist doctor and he recommended using specs. But even then, there was no cure for my headache. As there was no other option I was continuing with this difficulty. It was at that time, you dear uncle visited our family and asked us concerning my vision problem and persuaded my family to take me to some other advanced hospital to check whether my problem could be cured with a surgery. Thus my family took me to Little Flower Hospital Angamaly, one of the well-known eye hospitals in Kerala and the doctors promised that not only my vision problems but also the squint could be cured with a surgery. It was the happiest day in my life. I cannot express my feelings of God’s concern to me through you by mere words. We informed this happy news to you through Rev. Sr. Daphne and with your special support surgery was done for both my eyes after my 10th grade exams. I was in the hospital for three days and was advised to take two weeks complete rest. Afterwards I was being taken for advanced check up too. Now by God’s grace I can see clearly without using glasses and like any other growing up girl I am happy that my squint is cured. I was really depressed with the same but did not share this sadness with anyone. So my family and I express our deep felt gratitude for this great favor to me and assure you that I will study well and achieve a position in the society through which I could help my fellow brethren who are in utter despair. I am really touched with your helping mentality after looking to the dire needs of the poor like us and the good God will surely bless you and your family in return of your sharing and compassionate love.